A main road in Warwickshire was closed after a light aircraft made an emergency landing on it. 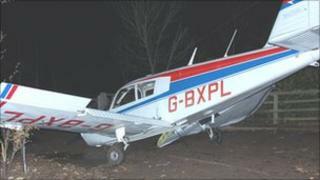 Pilot Chris Hall walked away uninjured from the damaged Piper PA-28 which landed on the A429 at Wellesbourne earlier. Mr Hall, of Earlswood, Warwickshire, said remembered his "instructor's words" during the incident. The ambulance service said it was "more of a heavy landing" than a crash. Senior paramedic officer Martyn Scott added: "The pilot got up and walked away. There was not a mark on him. He was totally uninjured." Mr Hall said: "On climb out the engine decided that it wasn't going to play any more, so I remembered my instructor's words, which were 'find a field', so I did." The pilot added he had just taken off. He said: "I'd just been doing circuits actually, so I'd done six or seven take offs and landings in the previous hour. "So I was very familiar with what the plane was doing and what the conditions were, which did make it really easy to recover from what could have been quite a dangerous situation."